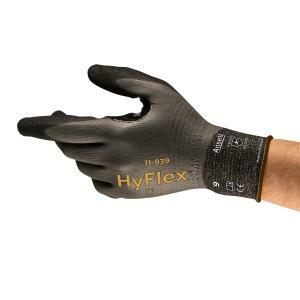 The Ansell HyFlex 11-939 full coated oil repellant level B cut resistant glove provides protection from cuts and oil exposure, from light to heavy, across multiple applications and within a series of different dip-line gloves (3/4 dipped, Full dipped). RIPEL Technology prevents fluid from making contact with the workers skin, keeping hands dry. It provides dexterity and a high level of comfort with ZONZ technology. Superior Grip Performance with ANSELL GRIP Technology for safe handling in dry-to-oily applications. FORTIX Technology for extended product use life and increased protection with up to 12x durability in the thumb crotch.